The READ Act passed and became law. This is a huge step forward to ensure quality education for all. Today, the Global Campaign for Education-US (GCE-US) released a call to action highlighting the critical role that education plays in U.S. foreign policy efforts. In this document, members of the international development, humanitarian and education communities make the case for the power of education and encourage its inclusion in the new administration’s and Congressional global development priorities. The Global Campaign for Education – US, a broad-based coalition of over 80 members dedicated to ensuring universal quality education for all children, applauds efforts to address the global refugee crisis during the 71st Session of the UN General Assembly, but calls for greater funding, transparency and accountability regarding commitments made to expand access to refugee education. The Global Campaign for Education – US, a broad-based coalition of over 80 members dedicated to ensuring universal quality education for all children, urges the United Nations, the U.S. Government and world leaders to accelerate progress towards universal access to education for displaced children. The Global Campaign for Education-US stands in solidarity and appreciation with the newly created Education Cannot Wait fund for education in emergencies. Launched at the first ever World Humanitarian Summit in Istanbul, Turkey, the fund was created to fill a massive gap in humanitarian funding—ensuring the full continuum of the right to education. The Global Campaign for Education-U.S. Chapter, a broad-based coalition of over 80 members dedicated to ensuring universal quality education for all children, expresses its serious concerns over the lack of access to education and learning in crisis and conflict settings, and calls on the U.S. Government to increase its financial and political support to address this issue. Friday, Global Campaign for Education-US Chapter and more than 30 of its coalition members have called on President Barack Obama to #pledge4kids at the June Global Partnership for Education Pledging Conference for the 2015-2018 period. In the letter, also sent to Secretary of State John Kerry and USAID Administrator Dr. Rajiv Shah, the signatories ask for the U.S. government to make a 2 year $250 million pledge to help support the work that the Global Partnership for Education is doing to ensure quality education for all children around the world. The Global Campaign for Education-US Chapter echoes Representative Nita Lowey’s vocal disappointment in the recent US Agency for International Development (USAID) FY15 Budget request for basic education. Today, the Global Campaign for Education-US Chapter congratulates the U.S. on becoming a U.N. Global Education First Initiative Champion. 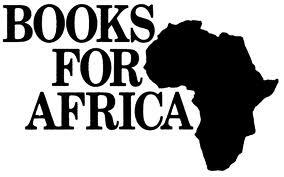 Books For Africa collects, sorts, ships, and distributes books to students of all ages in Africa to end the book famine in Africa.